Here’s an old image courtesy of Syd Bird showing the old Hoylake railway station. We’ve no idea of the date, but it must have been along time ago! After a little bit of searching I stumbled upon this informative page about the old Hoylake signal box. The signal box closed in 1994 apparently …I can remember seeing a bloke in there raising and lowering the level crossing gates. I wonder if the signal box is actually used for anything now? One of the chaps (I can’t remember his name) who now mans the counter at Hoylake station was the last signalman to operating the box you mention and the exhibits in the Liverpool bound waiting room (tickets, photographs, timetables etc.) are drawn from his private collection. I’ve had a few interesting chats with him whilst waiting for the train about his life working on the railways. Thanks for that info …I’ll see if I can pop along and have a chat with him sometime. Maybe a railway buff can date the photograph, the line was formed in 1883 and electrified in 1938 when the new station was built. Steam was still used for the daily coal trains up to the late 60s. My guess is the photo is early 1900s. The under river bit (separate company) was electrified in 1903 and I think the actual Mr Westinghouse himself was involved. I remember the New Brighton-Liverpool trains with their funny clestory roof and a middle rail for electric pickup. Very interesting photo. 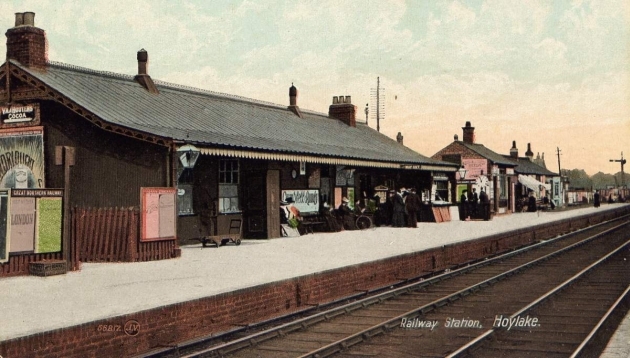 My mother worked as a booking clerk between the years 1914 – 1920 at this station. The Station Master at his time was a Mr Cherry. I have a reference written by him on my mother`s behalf. Unfortunately she had to leave in order that ex soldiers seeking employment were to replace female staff. work in the City by horse and carriage. Fares were often tendered by means of gold sovereigns by city merchants. The dress code identifiable from the photo would appear to be from the above period.